Recently, we discussed about the gnome-screenshot utility, which is a good screen grabbing tool. 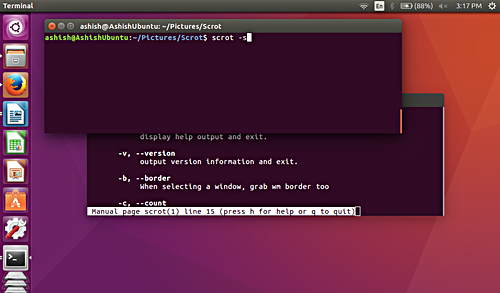 But if you are looking for an even better command line utility for taking screenshots, then you must give Scrot a try. This tool has some extra features that are currently not available in gnome-screenshot. In this tutorial, we will explain Scrot using easy to understand examples. Please note that all the examples mentioned in this tutorial have been tested on Ubuntu 16.04 LTS, and the scrot version we have used is 0.8. 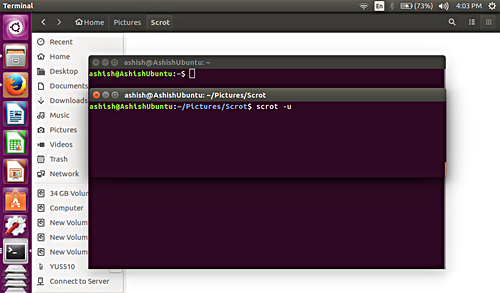 Scrot (SCReenshOT) is a screenshot capturing utility that uses the imlib2 library to acquire and save images. Developed by Tom Gilbert, it's written in C programming language and is licensed under the BSD License. Note: The parameters in  are optional. In this section, we will discuss how the Scrot tool can be used and what all features it provides. When the tool is run without any command line options, it captures the whole screen. If you want, you can check the version of scrot using the -v command line option. Using the utility, you can limit the screenshot to the currently focused window. This feature can be accessed using the -u command line option. The utility allows you to capture any window by clicking on it using the mouse. This feature can be accessed using the -s option. For example, as you can see in the screenshot below, I have a screen with two terminal windows overlapping each other. On the top window, I run the aforementioned command. Now suppose, I want to capture the bottom terminal window. For that, I will just click on that window once the command is executed - the command execution won't complete until you click somewhere on the screen. Note: As you can see in the above snapshot, whatever area the bottom window is covering has been captured, even if that includes an overlapping portion of the top window. The -u command line option we discussed earlier doesn't include the window border in screenshots. However, you can include the border of the window if you want. This feature can be accessed using the -b option (in conjunction with the -u option of course). Note: Including window border also adds some of the background area to the screenshot. You can introduce a time delay while taking screenshots. For this, you have to assign a numeric value to the --delay or -d command line option. In this case, scrot will wait for 5 seconds and then take the screenshot. The tool also allows you to display countdown while using delay option. This feature can be accessed using the -c command line option. Using the tool, you can adjust the quality of the screenshot image at the scale of 1-100. High value means high size and low compression. Default value is 75, although effect differs depending on the file format chosen. This feature can be accessed using --quality or -q option, but you have to assign a numeric value to this option ranging from 1-100. So you can see that the quality of the image degrades a lot as the -q option is assigned value closer to 1. 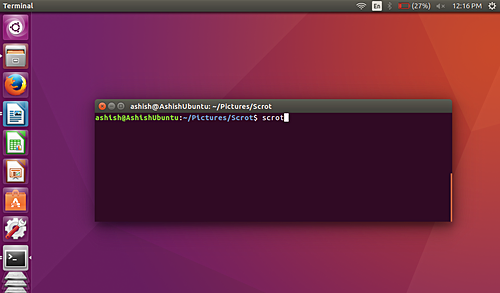 The scrot utility also allows you to generate thumbnail of the screenshot. This feature can be accessed using the --thumb option. This option requires a NUM value, which is basically the percentage of the original screenshot size. Note: The --thumb option makes sure that the screenshot is captured and saved in original size as well. In case your machine has multiple displays attached to it, scrot allows you to grab and join screenshots of these displays. This feature can be accessed using the -m command line option. 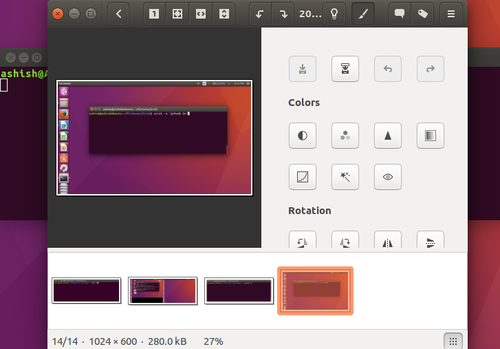 Here, gthumb is an image editor which will automatically launch after we run the command. So you can see that the scrot command grabbed the screenshot and then launched the gThumb image editor with the captured image as argument. If you don’t specify a filename to your screenshot, then the snapshot will be saved with a date-stamped filename in your current directory - this, as we've already mentioned in the beginning, is the default behaviour of scrot. It's worth mentioning that $n is a special string, which provides access to the screenshot name. For more details on special strings, head to the next section. Several specifiers which are recognised by the --exec and filename parameters are discussed below. $f – provides access to screenshot path (including filename). If you will not specify a filename, then scrot will by-default save the snapshot in a date stamped file format. This is the by-default date-stamped file format used in scrot : %yy-%mm-%dd-%hhmmss_$wx$h_scrot.png. $s – gives access to the size of screenshot. This feature, for example, can be accessed in the following way. Similarly, you can use the other special strings $p, $w, $h, $t, $$ and \n that provide access to image pixel size, image width, image height, image format, $ symbol, and give access to new line respectively. You can, for example, use these strings in the way similar to the $s example we have discussed above. The utility is easy to install on Ubuntu systems, which is good for beginners. Scrot also provides some advanced features such as special strings that can be used in scripting by professionals. Needless to say, there is a slight learning curve associated in case you want to use them. Any clue on how to achieve this? Sorry to bother you again, but I haven't found any help about this. Perhaps you have an idea.